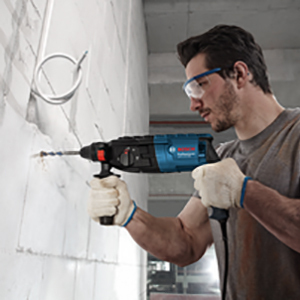 The Heavy Duty Breaker is intended for heavy chiselling and demolition work of structural concrete, brick, stone and asphalt. Before any work on the machine itself, pull the mains plug. Clean the tool shank and apply a light coat of grease. Pivot the tool retainer upward by approx. 150° and insert the tool into the tool holder. Pivot the tool retainer down to lock the tool. Check the latching by pulling the tool. To start the machine, press the On/Off switch and keep it pressed. To switch off the machine, release the On/Off switch. 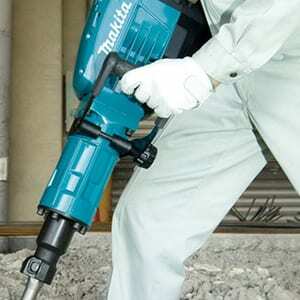 For low temperatures, the machine reaches the full impact rate only after a certain time. 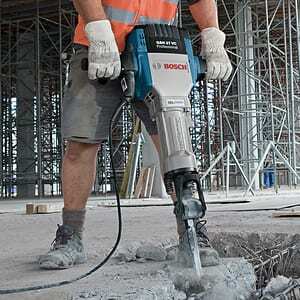 This start-up time can be shortened by striking the chisel in the machine against the floor one time. 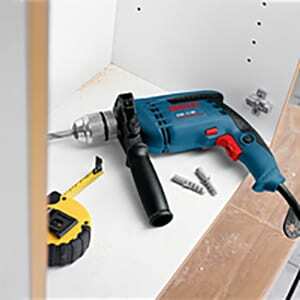 To save energy, only switch the power tool on when using it. For the highest possible impact damping, work only with moderate pressure. Be sure the bit is secured in place before operating. while by operating it under no load. This will loosen up the lubrication. Without a proper warm-up, hammering operation is difficult. Do not touch the bit or parts close to the bit immediately after the operation; they may be extremely hot and could burn your skin.